This post is also sponsored by UltyResults, the creator of the Ultimate Athlete Project and the Ultimate Skills Project. It was written by Jake Waller. #22 New Jersey Jughandle made the breakthrough to the Club Championships for the first time in team history after upsetting the seedings at Mid-Atlantic Regionals. Even with the formalities of a coaching structure and training program, the team culture this season remained one of enjoyment, as it always has been. “I’ve been on Jug for six years now and we have always been a very spirited and fair team. Even before the season started, we talked about gender equity and how we wanted to be an equitable team. We run 3-4 as much as 4-3. Our women are dominant, and we have plays that highlight that. It’s something that’s very important to the team and it’s now second nature, it’s something you don’t even think about,” said Kochenash. While striving to keep their values, there’s also been a push in the last few years from a lot of the younger players to become more competitive. “Jughandle is a group of good players, with a lot of talent on the team, and a lot of players chose to stay with Jug instead of playing open or women’s because of the culture and how much we love the team. But we wanted to go to the next level,” Kochenash said. So how did getting a coach for the first time and committing to a structured training program change things? Their mental game was something Jarvis actively targeted from early on in the season. She’d keep track of scoring trends and noticed Jug would often trade with tough teams, only to concede three or four breaks in a row before trading again. This habit was killing their chances of earning valuable wins. She urged them to work towards having no “naps” in the middle of games, and a team mantra of “no siestas, all fiestas” was born. Part of playing for Jug is recognizing their perennial underdog status in the Mid-Atlantic, something that inspired a strong connection with their nearby NFL franchise, the Philadelphia Eagles. In the 2017 season, the Eagles became the first ever no. 1 seed to open the postseason as underdogs and made a mockery of that status by securing their first Superbowl title. Jug embraced the Eagles and their story as a parallel of their own, from henna eagle tattoos, “hungry dogs run faster” chants, and even an impassioned speech drawing on Jason Kelce’s famous words spoken on the steps of the Philadelphia Art Museum at the Eagles’ victory parade. At the speech’s conclusion, a fired-up Jug team took down West Chester Loco 14-12 to qualify for the Club Championships. The other factor that Kochenash was eager to recount was the contribution of the Ultimate Athlete Project. The whole team committed to the program and there were several reasons why he believes it worked so well for them. First off, the physical improvements. “I cannot say how great I feel from doing the UAP. I’d worked out before, doing squats and stuff I learned in high school, but this felt different. I remember laying out in our first tournament and feeling muscle in my shoulder where I’d landed! I felt like all my joints were supported and strong. My recovery after tournaments felt better. It felt like injury prevention more than anything, which was fantastic and exactly what I was looking for,” he said. 39 and 38-year-old handlers Harrison Treegoob and Thomas “Chainsaw” Johnson stood out as UAP beneficiaries. “They both bought into the UAP 110% and watching them commit, and then have the best seasons I’ve seen from them, was inspiring. That athleticism meant that they made plays instead of being sore spots in our defense. Having them buy in, as emotional leaders and such experienced players, definitely fired me up,” said Kochenash. What Does Nationals Hold for Jughandle? The UAP workouts have continued in preparation for San Diego, along with other pre-tournament activities. Jughandle aren’t taking anything for granted but are feeling good ahead of the weekend. Practices have been hot, the team has been out fundraising, and they spent time last weekend with youth club DeVYL, who have sent half a dozen players into Jug. It was an additional bonding experience for the team, all clad in the jerseys they’ve been wearing a little more proudly of late. “There’s a difference in wearing the jersey the past few weeks. It holds some more weight knowing that we’re going to Nationals,” Kochenash said. So what are the team’s expectations? This is something they’ve struggled with. While it’s uncharted territory for many of their players, they’re riding the emotional wave of beating three higher-ranked teams. “We really do believe that we can beat these top teams. We’ve played Space Heater close every single game. It’s been really difficult trying to find that expectation, balance the competitive and the fun,” said Kochenash. Fun is, of course, very much still a part of the equation. “As much as we believed it, it was still a surprise and a difficult road to get to Nationals, so we definitely want to enjoy it. I’ve never been to Nats! I want to hang out and jersey trade,” he said. Nevertheless, they have been discussing playing time expectations—something Kochenash admitted they struggled with early on as coach Jarvis was busy multitasking. Having assigned clipboard buddies to take that off of her plate, that burden was lessened. Team leadership’s faith in their teammates shows. “We’ve played very loose lines all year and that’s something we want to stick to. We have a very deep team. It’s a great feeling knowing everyone on the line is going to bring it,” Kochenash said. Nationals, you have been warned: the joyfire’s coming. Check out the Ultimate Athlete Project to see how it can help your team reach new heights! 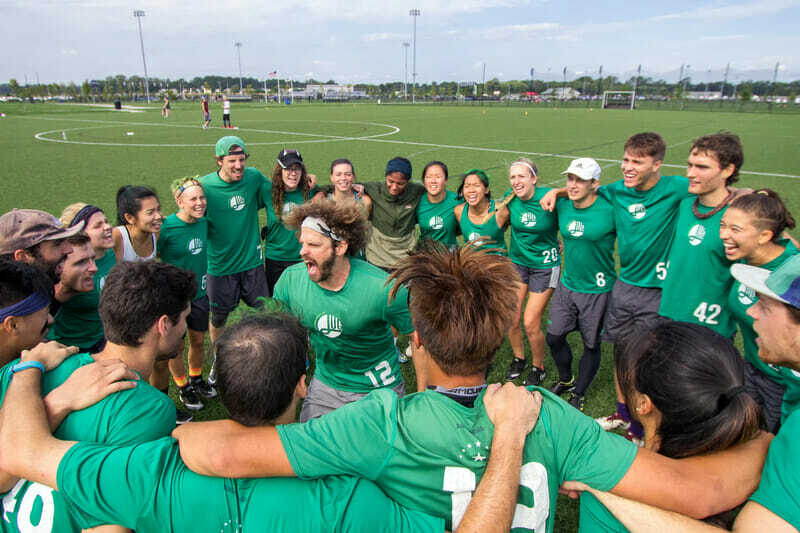 Comments on "Coaching and Commitment: The Path to Jughandle’s First Nationals"